Unique steel products made in the heart of Devon by Palmers. in Devon using local materials whenever possible. 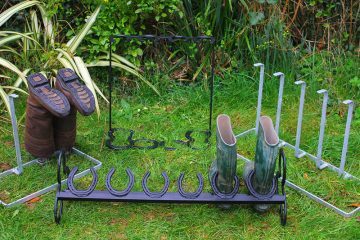 Our handcrafted and bespoke horseshoe range is ideal to take pride of place in your home and in your garden. If you’d like to come and see our products first hand we regularly attend local shows across the South West. 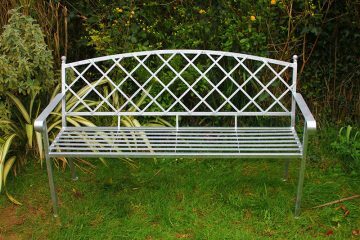 Our sturdy steel benches are a great addition for your garden, or outdoor space. View our full range of galvanised two/three seat varieties here. We are delighted with the bench Eric made. It arrived very quickly after ordering and looks very much at home in a country garden. It's not only decorative but comfortable too and much more durable than most benches on sale today. We have found the bench to be very comfortable and is very strong and robust. We have had customers ask us where we purchased it from. I bought the horseshoe bench for my girlfriend's birthday after first seeing Eric’s products at the Cornwood Show and I must say that it was a fantastic buy. It is really well made and the sturdiest bench I have ever seen. It sits proudly outside the front of our house and the girlfriend absolutely loves it and has survived its first winter exposed to the elements really well. Eric was even kind enough to deliver it on a specific date and even added a birthday banner on it as a special touch. Exceptional value for such a unique product. © 2017 Palmers Garden Products. All rights reserved.